William Batchelor Kingswood had become the first Master of the National School in 1863 (prior to this the school was run by schoolmistresses). On 17th January 1865, Mr. Kingswood recorded in the log book that it was his last day at the school. On 23rd January 1865 Henry Yeaxlee recorded in the log book: My first day at the School. Cold day and attendance about 60. School visited in morning by Rev. Baines [the curate]. Henry Yeaxlee was born on 4th August 1843 at Staines in Middlesex, the son of William and Mary Yeaxlee. William Yeaxlee was trained as a carver and gilder and Henry was the tenth child of their family of eleven known children. 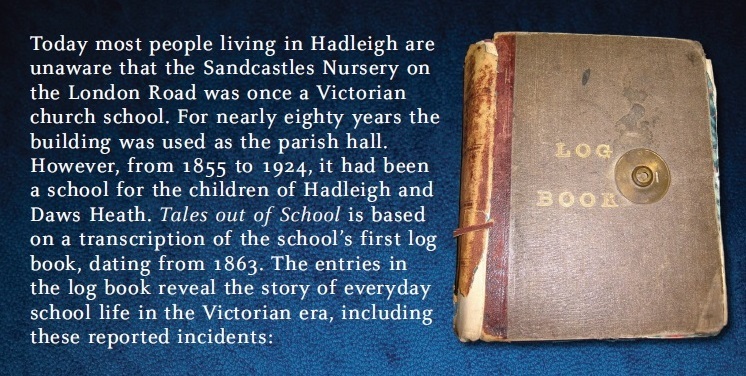 Henry was only 21 years old when he become the Master of the National School at Hadleigh. His eldest sister Mary came to live with him in the school house on the corner of the village street and what is now Common Hall Lane. She also worked as a schoolmistress in the school and would be in charge of the school in his absence. The log book for 8th February 1865 records: Went to church this morning with choir, and in my absence Miss Yeaxlee, though suffering from ill health, took the School. On 31st March 1869 Henry Yeaxlee was married to Miss Lavinia Harvey at St. James the Less parish church by the rector, Rev. William Metcalfe. The groom was aged 26 years. His bride was the 19-year-old Lavinia Harvey, daughter of Stephen and Selina Harvey of Leigh. Lavinia, the oldest of their nine children, was born on 10th December 1849 on her father’s farm. By the time of Lavinia’s marriage, Stephen and his family lived at Leigh Park Farm (now the Highlands Estate). In the 1871 Census, the farm was recorded as being 220 acres, with Stephen Harvey employing 15 men. The witnesses at Lavinia and Henry’s marriage were her father and two of her sisters, Sarah and Annie. In 1869 Lavinia had four young sisters – Sarah, Annie, Rebecca and Minnie – and maybe they were all bridesmaids at the wedding. Henry and Lavinia were to celebrate over forty-five years of marriage. The first three of their seven children – Edith, Margaret and Henry – were born during their time at Hadleigh, whilst the youngest four – Albert, Lucy, Archibald and Francis – were born in London.